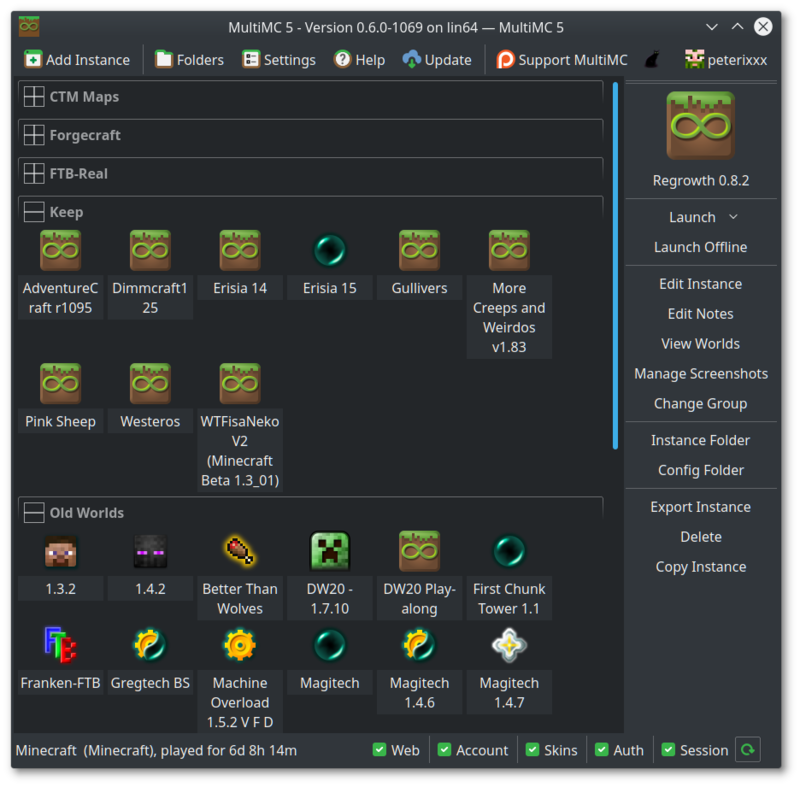 MultiMC is a free, open source launcher for Minecraft, managed by @Forkk13, @peterixxx, and @drayshak. It allows you to have multiple, separate instances of Minecraft (each with their own mods, texture packs, saves, etc) and helps you manage them and their associated options with a simple interface. If you'd like to link to MultiMC somewhere, please post a link to multimc.org, rather than this forum post. Thanks. More information, download links, and screenshots for MultiMC can be found at multimc.org. Please go there for more info. Why not just setup a batch file that redirects the launcher lol? That's what I do. If I helped you or just made you smile, please feel free to click the green +. This makes it much easier and more organised. Yeah, I've got 9 different Minecraft installations. I keep them all in a folder on my external hard drive. I just set them up to run in a portable mode, so I can plug in and play them anywhere. If I helped you in any way, or if you think my smart-assed comments were funny. Please hit the green button in the lower right corner of my post. Thanks! As I said. You can do that with MultiMC too, it just makes it much easier to manage them. javaw -Xmx1G -Xms1G -jar "C:(location of minecraft)"
I want window pics before i download though. The only difference between the Windows and Linux version is the theme. All of the buttons and other things are in the exact same spot. I can't see your pictures. I want windows pictures that i can see! What's not working? What OS are you using? Is it 64 bit or 32 bit? Are you using the latest version of .NET or Mono? Do you get an error message? It's not showing up. Windows. 64 bit. Yes. MultiMC has stopped working right after i press run.